MASKerade: Ellen Hutson Pin-sights - Happy Day! Ellen Hutson Pin-sights - Happy Day! This is for the current Pin-Sights challenge over at The Classroom. I was inspired by the photo in the bottom centre - that rainbow 'grid' of diamond rings really caught my eye! 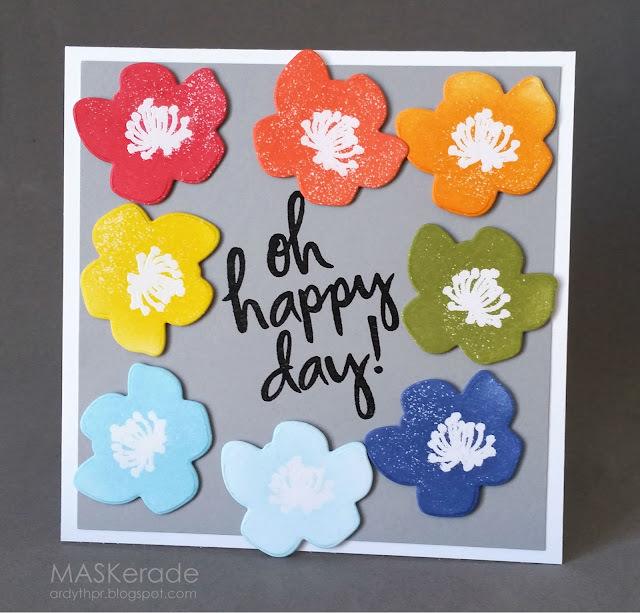 I used a flower die from Bold Blooms and embossed a little stamp from the matching stamp set for the flower centres, using clear embossing powder. I sponged each flower with Distress Ink and laid them fairly haphazardly on a grey panel. I stamped the sentiment (also from Bold Blooms) in Versafine Onyx. Love those colors you chose! Great colours and love the effect of the clear embossing! Love how you worked in so many of the fun colours from the board and the shimmer and sparkle on the petals for those diamond rings! A rainbow of flowers always makes for a happy day! Love this! Lovely layout and rainbow flowers!